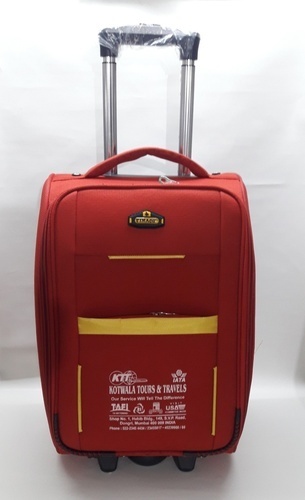 We are the renowned manufacturers, exporters and wholesalers of Wheel Luggage. Leather trolley bag of our brand are available in different sizes and in various colors. We mainly use high quality leather and this premium quality offers a classic and sophisticated look to the trolley bag. In our trolley bag there is enough space in the upper flap to keep stationary and files. In the lower box of the trolley bag there is straps for holding the files. HARI OM LEATHER, established its operations in the year 2014. This impeccable range comprising the finest Card Holders, Cheque Book Holders and Ladies Purse, is known to be highly praised and preferred in the market. Its making done in compliance with the set industry norms and guidelines, using the finest grade of leather available, makes the product one of the best options available in the market. In addition to this, the range is known to be marked at the most reasonable rate possible. The state-of-the-art infrastructural infrastructure at Pakeeza Leather, has been laced with all the necessary machines and equipment. This helps us in generating greater productivity. For reasons of maximising our presence in the market, we keep upgrading the facility on a highly regular basis. To manage the operations of the firm, in the best possible manner, the facility has been parted into several highly operational units. These units, in the most effective manner, help us attain several of our goals and targets, predefined. In addition to this, our ethical work practices, has helped us generate a huge client base.